Welcome to Season 3 of the Productive Muslim Podcast. 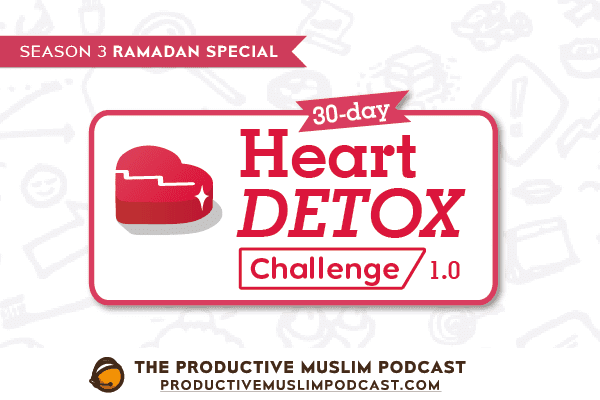 In this season we will be releasing short daily podcasts during the month of Ramadan, dedicated to the Heart Detox challenge, hosted by Zaynab Hamdi. The purpose of this detox challenge is to help detox spiritually and let go of bad habits and build good ones. During this challenge, you will have daily tasks to do, and things to abstain from in order to build a stronger spiritual connection with your creator. In today’s episode, we look at the Productive Muslim sleep routine, and what we need to do in order to get a good night’s sleep! Enter our Ramadan Giveaway to be in the draw to win a copy of the Productive Muslim Audio Book + One Year Subscription to the ProductiveMuslim Academy. Click here to enter! Did you know that you can tune into our podcast through mobile via iTunes or Stitcher Radio? For more resources including pre-Ramadan, Ramadan, and post-Ramadan courses, check out the Productive Muslim Academy. Zaynab Hamdi is a young entrepreneur heavily involved in the development of children and youth. She is creating resources for learning about Islam and Arabic and is a helpline volunteer for the Muslim Youth helpline.